Because the state seal of Kentucky is the insignia for the commonwealth, Attorney General Opinion 72-694 holds that use of the seal by private concerns for private purposes is generally against public policy. 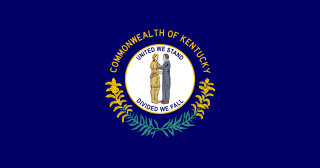 Use of the state seal by non-state entities may be unlawful and could be considered unfair, misleading, or deceptive within the meaning of the Kentucky Consumer Protection Act. 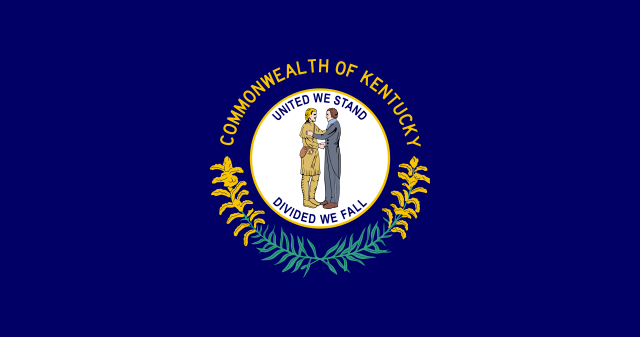 The state seal of Kentucky should not be used for commercial or private purposes as it could suggest the Commonwealth of Kentucky has placed its imprimatur upon a private endeavor. For more information, please visit the Kentucky Secretary of State's Office at http://www.sos.ky.gov/executive/stateseal. 当前 2011年4月4日 (一) 05:36 950 × 500（237 KB） Zscout370 I still have an image from the Special Assistant to the Secretary, Office of the Secretary of State of Kentucky, for the official image of the state flag. The font is not correct, but trying to work on that. Fixed the wreath.